Sometimes a footpath is closed for so long that you imagine it'll never open again. There have been plenty of these in the Lower Lea Valley over the last decade, mostly as a result of the Olympics, but with Crossrail works severing several foot connections too. The Greenway north of Stratford High Street has been closed since 18th April 2009, for example, and opened only briefly during the summer of 2012 to allow passage for Olympic spectators. So I'm pleased to be the bearer of good news about a footpath that's been sealed off for even longer, since 20th March 2007 in fact, and which has been silently reopened this week. 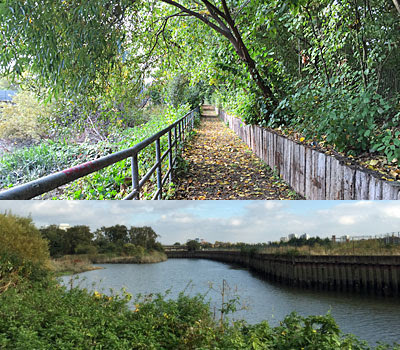 It's the footpath along the edge of Abbey Creek, a minor backwater between the Greenway and Three Mills, and which can be seen from the tube to the east of Bromley-by-Bow station. This time the closure was thanks to Thames Water, originally to aid the construction of Three Mills Lock, and with the intention of reopening in the summer of 2008. Didn't happen. The next excuse was the Lee Tunnel, a massive sewage-related infrastructure undertaking, coupled to a proposed reopening date of Christmas 2014. Didn't happen either. Instead it's taken until October 2016, a few months short of ten years, but the Long Wall Path is finally accessible again. "And Will Remain Open For The Foreseeable Future", says a helpful laminated sign tied to the unlocked gate. 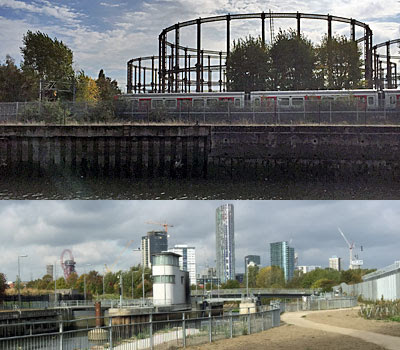 The Greenway is all about sewage, a giant Victorian pipe carrying north London's waste to Beckton with a footpath laid on top. 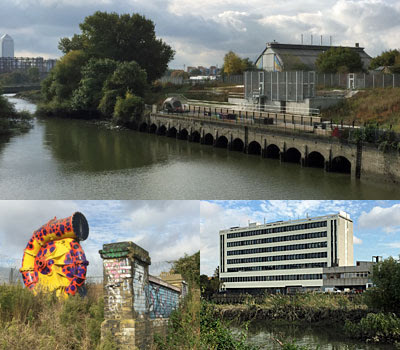 Its focal point is Abbey Mills, where one old and one new pumping station sit alongside the waters of the Lea, occasionally overspilling into Abbey Creek. Or at least they used to overspill, dumping 40% of London's Combined Storm Overflow through a row of sluices into the river, but that's all changed since Boris opened the Lee Tunnel earlier this year. Abbey Creek is now free of nasty organic floaters, and the ecosystem from here down to the Thames is a more regularly pleasant environment than it was before. And this means the footpath running alongside is more pleasant too, not that it was ever obviously unpleasant, not that I can really remember given how long ago it was open to the public. The Long Wall Path begins at a bridge over what used to be the Channelsea River, long since culverted to the north through the Olympic Park and central Stratford. Look out for the graffitied snail, a brightly painted swirl of pipe behind the wire fence, to mark the start of your waterside stroll. The sluices are best seen before you set off, 14 burrow-like holes from which brown liquid occasionally gushed when it rained too much, but which are now more ornamentally inert. It's immediately obvious, to those who've walked this way before, that a lot of infrastructure work has taken place over the last few years. Two metal cages have appeared on the banks where previously there were none, one monumental in scale, containing pipes and pumps diverting surplus flow elsewhere. A choice of routes remains available to cyclists and those on foot - one via the river's edge, the other higher up - but a lot of concrete has gone in where facilities were previously low key. That pair of chunky planters look new but were added in 2004, according to the plaque, constructed from railway sleepers by community volunteers. Two similarly resilient benches provide somewhere to sit and look across towards Channelsea House, previously a stark lonely office block, now 72 apartments. Thames Water have done their work and made good, even if it's taken them an age. To chime with modern times the path is now fully accessible, thanks to an expensive zig-zag ramp which links the upper path at Greenway level and the lower continuation. The two alternative footway options join up a short distance ahead below the Abbey Mills perimeter fence, and then the creekwalk proper begins. It's still October, so much of the path is screened off from the water by trees in leaf. Any blackberries are shrivelled and well past their best, unsurprisingly given that nobody's been able to come brambling this autumn, but there are also a few clusters of red berries which might (but please not yet) form an attractive festive centrepiece. In a couple of locations invasive Japanese knotweed has been identified, and screened off behind fencing prior to someone hopefully coming along and doing something to remove it. Elsewhere the traditional Lower Lea mix of bush and bracken and grass holds sway, ensuring that this wildlife habitat remains appealing to many estuarine species. The best views come where the treeline breaks, across a broad creek which might be filled by the tide or might, six hours later, be mostly mud. As well as waterfowl you'll see a lot of trains, rattling by to Barking, Upminster or Southend, with the Twelvetrees gasholders rising elegantly in the background. At one point the path nudges fractionally inland to avoid an eroded bank, adding an unnaturally prefabricated slant to proceedings. I noted that a lot of understated remediation work has been going on, for example the ground under foot is scattered with gravel, so this shouldn't become a mudbath in the winter. But don't expect to meet any other walkers along here, not yet, if ever - the most I bumped into was a slightly startled cat. On the right hand side after the waterworks, or on the left if you're walking the other way, is this blog's favourite secret location. Mill Meads is the site of Channel 4's first Big Brother house, home to Craig and Nick and Brian and Marjorie the chicken, conveniently located for the Three Mills studio where the programme was made. In 2002 the programme moved to Borehamwood and this meadow lay empty, then was sealed off, and has since been used to dump spoil from the Lee Tunnel. The ground's now much higher than before, the ultimate intention being to reopen this as a landscaped public space as part of the Leaway project. For now, however, it looks like a landfill tip infested with scrappy undergrowth, and any physical reacquaintance will have to wait until someone deems the site reborn.